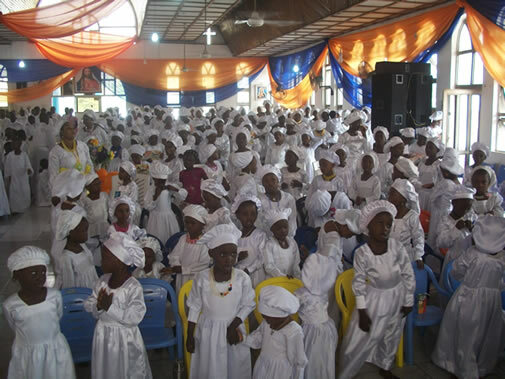 Every first Sunday in June of every year witnessed the juvenile harvest in the celestial church of Christ and this followed by the Adult harvest across the parishes. More reason on a special day like this,the needs of our children must be met. The day marks their own Christmas season,therefore a new sutana must be tailored and perfectly ironed to fit them. They must be well fed and not looking famished as if they are coming from fasting and prayer mountain. Since it will take a while to serve the harvest food. The harvest food must also not be too late because the children don’t have much staminal like adult. Parents or ward must be at the peak of tolerance as children will be at the peak of misbehavior today which would trigger annoyance from mum and Sunday school teachers. No amount of misbehavior should elicit caning, spanking,flogging or curses or abusive words against them. “Behold l sent an Angel before thee to keep thee in the way,and to bring thee into the place which l have prepared. Beware of him and obey his voice,provoke him not; for he will not pardon your transgressions for my name is in him”Exo23:20-21. The angel of the children had been on guard days before the harvest and will be on guard till the harvest ended so they will record and report whatever you do against them to God. So we must be careful. The food for the juvenile should not be packed home as some greedy mothers does and keep warming them much later at home from deep freezer with microwave. .Similarly some gift given to the children by the kind hearted should be well circulated because if entrusted such gift in care of greedy and dishonest official the gift are not well dispensed to the children, rather they are packed to meet the needs of their invited friends and relatives outside the fold. We must get one thing clear the juvenile harvest is for the children not for the Adult and they must be adequately taken care of. If children are deprived of feeding and their gift it is a serious offence before God.l pray we should not incurred the wrath of God because non of children must leave the church unhappy. Safe environment with security must be provided for them. Missing child must not be recorded and no child must sustain injury. lt is also an opportunity for the barren to unlocked the door of blessings to all barren in the house of God. We must jettison the idea of putting loin, palm frond,cassock or top coat (ileke) on the children to segregate them from others. This are part of the strange doctrine introduced by some Shepherd which is not part of the legacy of the founding fathers. So we must avoid saddling the children with heavy laden by clothing them with ranks and regalia above their age. We must stop copying other white garment. We are uniquely made and given adequate doctrine. May we do the right in the sight of the Lord.